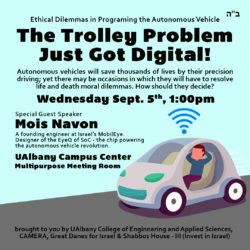 The UAlbany School of Engineering and Applied Sciences, along with Shabbos House III (Invest in Israel), Great Danes for Israel and CAMERA invite the campus and greater community to a guest speaker on a fascinating contemporary topic: the ethics of self-driving vehicles. Mois Navon, a founding engineer at Israel’s MobilEye (bought out by Intel for $15.3 billion! ), worked on the chip specifically designed for “seeing” cars. He previously worked for IBM and NASA’s JPL. He will be speaking on “The Trolley Problem Just Got Digital” which delves into ethical dilemmas in programming the autonomous vehicle which is becoming more and more of a reality in our time. The event is Wednesday, September 5th, 1pm in the Campus Center West Multipurpose Room. All are welcome. Kosher Refreshments will be served.